MSC Cruises is pleased to present MSC Seaview, the newest and largest member of its fleet. Guests will be in awe of its incredible selection of roomy staterooms and suites, exciting kids' club, wonderful aquapark, and range of entertainment and dining choices. Visit the ship's stunning 360° promenade, a lively recreation area where you can take a leisurely stroll. Shop in the ship's boutiques and sample the offerings at its wide variety of restaurants and bars. MSC Seaview brings travelers and the sea closer, with contemporary design and elegance amid tropical weather. Spend quality time dining, drinking, and enjoying bright sunshine along with some of the most amazing views in the world. MSC Seaview is the perfect way to explore the wonders of the Mediterranean, including fabulous port cities such as Barcelona, Marseille, and Naples. Prepare yourself for an unforgettable cruise to the jewels of the Old World on a ship offering the best in modern amenities. 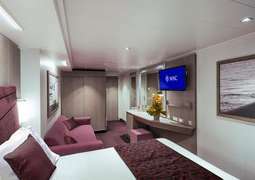 Experience an unforgettable tropical getaway with a cozy and spacious stateroom onboard this MSC Cruises ship. 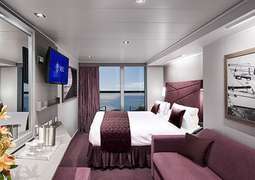 MSC Seaview staterooms are designed with maximum comfort in mind. 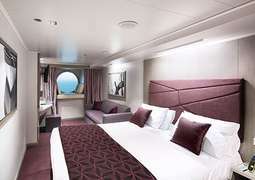 Interior staterooms start at 130 square feet, and Oceanview staterooms are 195 square feet. 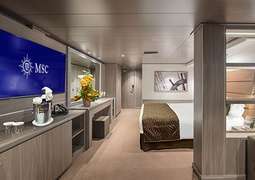 MSC Yacht Club Luxury suites offer exclusive perks such as access to VIP areas and personal butler service. Enjoy peace and serenity when you cruise on MSC Seaview. Experience a wide range of fine dining while enjoying panoramic ocean views on MSC Seaview. The ship's restaurants offer a lip-smacking variety of cuisine, including Asian, seafood, and steak. Add some spice to your life by stopping at El Sombrero, which serves mouthwatering Tex-Mex dishes such as enchiladas and guacamole. Ocean Cay Restaurant offers delectable fish dishes made with the finest of ingredients complemented by great wine. With two bowling arenas, a multistory water park featuring water slides, and the Metropolitan Theatre, MSC Seaview provides endless entertainment for the whole family. It also has colorful kids’ play areas and teenagers areas with a disco, gaming room, and a movie hall, ensuring your teens get the best of entertainment. While onboard, you can also enjoy a pirate show, a riveting opera, exhilarating acrobatics, classical musicals, and Broadway-style shows. Relax and recharge with a cleansing facial or massage at the ship’s spa, which also boasts a steam room, sauna, and whirlpool. The ship's daytime dress code is casual, and guests can wear everything from T-shirts and jeans to bathing suits and flip-flops. For elegant nights, formal dress is appropriate – pantsuits or dresses are suggested for women, and suits or tuxedos are suggested for men.